This plaza can be found across the famous Dambanang Kawayan Church. 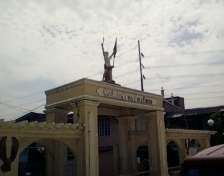 It was built as a tribute to Gat Andres Bonifacio who founded the Katipunan. His father, Santiago Bonifacio, is also a Tipas-Taguig Native. Andres Bonifacio and his father can always be found here recruiting new members of the KKK. National Heroes day commemoration events are held here every November 30.